What will the future of wireless communications look like? What drives mobile communications systems beyond 3G? 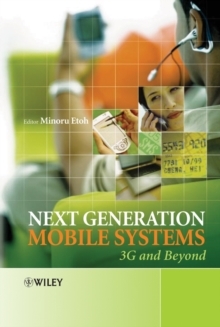 In "Next Generation Mobile Systems" the authors answer these questions and others surrounding the new technologies. The book examines the current research issues driving the wireless world and provides an inclusive overview of how established technologies will evolve to suit next generation mobile systems. While the term '4G' already dominates research in industry and academia, there are still numerous hurdles to take before this ambitious concept can become reality. Acclaimed researchers from NTT-DoCoMo take up the debate of what type of mobile communications will emerge in the post-3G era. "Next Generation Mobile Systems": covers the evolution of IP-based systems and IP mobility; gives a detailed overview of radio-access technologies and wireless LANs; explains APIs for mobile systems and IP mobility; addresses middleware and applications, including terminal platform technologies, multimedia, and wireless web services; and, discusses security in future mobile networks, including sections on Cryptographic Algorithms and Protocols for XG, Authentication, Authorization, and Accounting, and Security Policy Enforcement for Downloaded Code. This valuable resource will provide communications engineers, telecommunications managers and researchers in industry and academia with a sound understanding of the future direction of mobile technology.